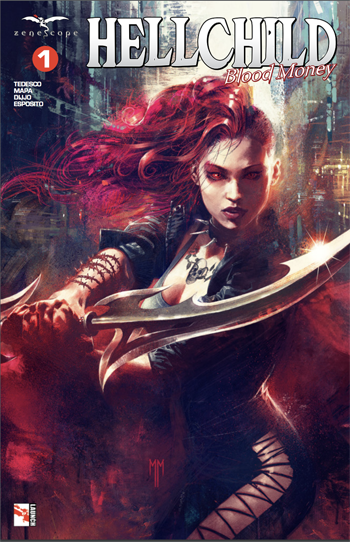 Advertised by “Zenescope Entertainment” as “John Wick meets Jessica Jones”, Ralph Tedesco’s narrative for Issue One of “Hellchild: Blood Money” probably better resembles something Eli Roth or Quentin Tarantino would direct rather than an American web television series based upon a “Marvel Comics” super-heroine. For whilst Angelica Blackstone undoubtedly has special powers, courtesy of being the half-vampire daughter of the Greek god Hades, this twenty-two page periodical’s plot primarily focuses upon the insanely violent tension between Marcus Paulson’s wealthy conglomerate and the somewhat more seedier prostitution racket of “this Tor guy”, rather than the titular character’s supernatural abilities. Fortunately however, despite the gratuitous nature of its surprisingly sadistic script, which genuinely can make a perusing bibliophile momentarily look away in abject horror, this opening instalment to a four-part mini-series is utterly enthralling, and contains at least one surprise which will doubtless serve as a curve-ball for many within its audience. In fact, having firmly set the scene as to who Harry the enforcer is to concentrate upon protecting, Tor’s decision to go looking elsewhere for their gory revenge first is as unsettlingly graphic as the assassin’s heavily fanged clown mask is deeply disturbing. Quite possibly the only thing therefore which lets this blood-spattered book down is its look, which is largely due to the somewhat wooden(ish) pencilling of Butch Mapa’s figures. The “professional illustrator” from the Philippines can undoubtedly draw, as seen in this publication’s frighteningly tense torture scene which vividly shows the true horror of their predicament in the faces of its victims. But the same cannot debatably be said for the artist’s panels featuring the likes of Angelica or the muscle-brain Stan, which arguably appear rather flat and two dimensional.